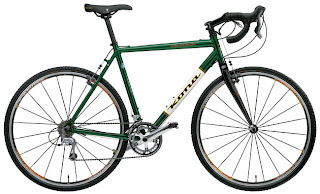 Ever since I heard about cyclocross bikes, I wanted one! Cyclocross is an odd bird in the cycling world. The races take place in the fall (in North America, later in Europe), and consist of several laps around a marked course. There are usually man-made obstacles requiring you to pop on and off your bike and tight turns to test your bike handling skills. The Kona Jake the Snake. I'm really excited, can't wait to get on it and put it through it's paces! It's basically a hefty road bikes. Wider tires, slightly wider handlebars for control, geometry a bit more suited toward handling rather than optimal aero position, and gearing focused more toward quick starts and stops rather than pushing big gears. Ride it! I have a lot of gravel roads and trails around my house, which usually I've ridden on my hybrid. But this bike is much better suited toward all but true mountain biking... it opens up a lot of during-season training options, rather than simply sticking to asphault on my road bike I can hit trails and give myself some different challenges. Race it! I have done Paris to Ancaster 5 years in a row, but the cyclocross bike is the ideal tool for the job. Can't wait to do that course justice! Cyclocross Races? Maybe... I'm not sure if my bike handling is quite up to snuff, but I'll probably try enter as a beginner sometime. We'll see! Love it! I got into cycling to lose weight, but in the process fell in love with riding. This bike is going to be fun, a new adventure, and I can't wait! So you finally got the bike! Sweet! How'd you swing it by the better half? I say go for some cyclecross races, they have them around the GTA in the winter quite frequently. Yup, I got it... doing more and more off-road and less triathlon these days, next year looks to be the same, so makes sense!